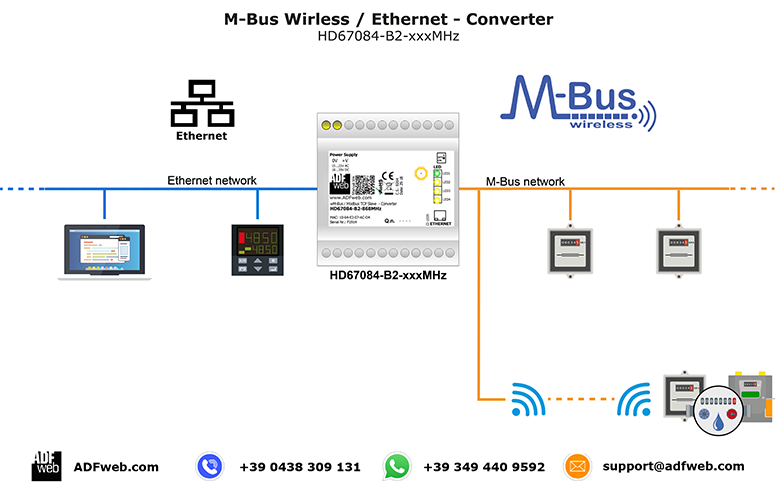 The HD67084-B2-xxxMHz are M-Bus Wireless / Ethernet converters. They allow to monitor some M-Bus Wireless meters (like Engelmann, Amber-Wireless, Maddalena, Siemens, exc. meters) with an Ethernet net. They are completely transparent converters and the data of the M-Bus Wireless meters are sent over Ethernet using TCP or UDP. On M-Bus Wireless side, the HD67084-B2 can manage up to 32 meters.